Thanks to all the speakers and attendees this year, see you all next February! "There were over 70 artists there on the night and we hope you all enjoyed it, we are chuffed with all the great feedback we received, we look forward to welcoming you back to our studio soon either to one of our own events or at another 3ds London event." 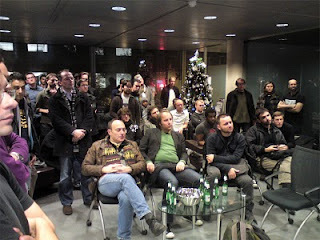 Next Wednesday 1st December I’m happy to say we once again enjoy the hospitality of Autodesk at their Soho offices for the last 3ds Max London User Group meeting of 2010. We also have a great speaker with a really cool project to present; Mike Merron recently worked as Technical Director at 1stAveMachine on the new Ford C-Max commercial. Mike is going to come along to show us how it was done, using 3ds Max, Vray, and Fusion amongst others. Of course, we’re always looking for other projects to watch and talk about, so bring something along! With no meeting last month and nothing planned for January it will be great for everyone to catch-up on Wednesday (the first week of the year is hectic enough, but rest assured we have another great talk pencilled in for February 2011). Please note there’s no User Group meeting this Wednesday 3rd November. I’m afraid the double whammy of no confirmed speaker or venue would make it tricky! Sorry for the late notice, I was hoping to get something together at the last minute but it didn’t happen in the end. We’ve been lucky to enjoy some great venues and speakers recently, good to see the evenings have been well attended too. I’ve struggled to find a suitable venue to replace the Black Horse Pub though, whilst they have let us down a few times it does have the advantage of being central, and free. I’ve been to almost every Pub in the West End now, but if you know somewhere else suitable let me know. Many hundreds of people know about the evening now, so some of you must be able to make a presentation at an upcoming event! It shouldn’t take too long to prepare and you’ll enjoy it, promise. We have just created facebook and twitter pages to complement our blog. As mentioned at the last meeting, this month Hayes Davidson have graciously offered to host the October event at their studio in Paddington. It’s a little further west than usual, but easy to get to, and the evening will start a little later to compensate. Please check the map linked above and look out for the big wooden door! Hayes Davidson need no introduction to anyone in our group really, I know their presentation will be excellent. Please do bring along any of your recent projects to show the group as well! I hope you enjoyed the change of scenery and the hospitality of Autodesk last month, we will be holding September's meeting there too. Please do bring along some work to show everyone and talk about, the evening's success always depends on everyone doing so. We have a very cool project, Royal Reformation, being presented this month by Paul Nicholls, http://pauldnicholls.com/. Paul is a freelance visualiser currently completing a Masters at the Bartlett. Definitely check out his great website and blog before coming along next week! This Wednesday 4th August I’m happy to say Ryan Lintott and James Shaw from Squint/Opera and the team will be talking about their recent work. After the mix up in June and the World Cup break in July it's good to get things back on track, especially with such great presenters! 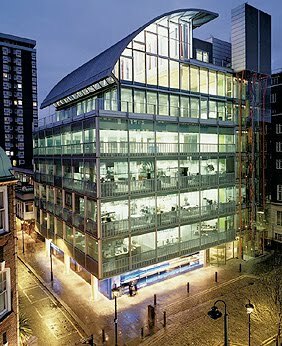 Jamie Gwilliam, Max specialist at Autodesk has kindly arranged to host the 3ds Max User Group at Autodesk’s Soho office this month. We've got a couple of great pub options for future evenings, but Jamie mentioned their new 3D projector (and beer) so I couldn't refuse! It will be nice to see everyone after two months, hope you can make it. After a quiet one last month, we have a great evening planned for this Wednesday. 3ds London regular Joe Robson kicks things off with a talk, ‘The Painted, The Unpainted and the Unpaintable; In Pursuit of Architectural Realism’. Joe is an elected council member of the Society of Architectural Illustration, he also lectures at the London School of Economics and Bath University at undergraduate and postgraduate levels, as well as internationally. 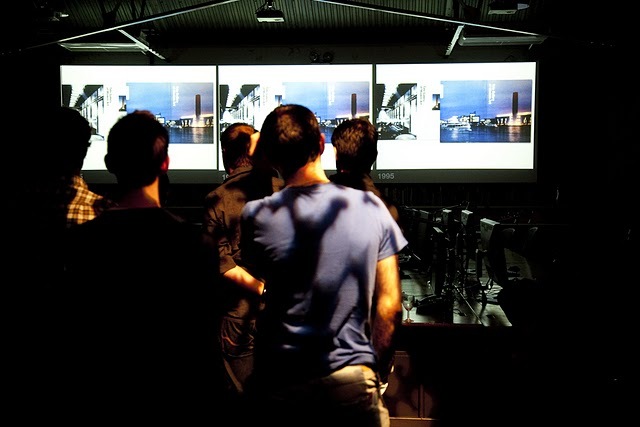 Currently he runs his own practice, AVR London, specialising in architectural illustration, verification and research. Joe's talk in November 2008 was fantastic so I'm pleased he's agreed to talk again. Autodesk App Specialist Jamie Gwilliam is coming along too, this will be one of your first chances to check out all the new 3ds Max 2011 goodness. Enough said! Hope you can make it, regards, Simon. Hello everybody, this Wednesday we don't have a confirmed presentation. I do try hard to find someone every month but sometimes... it just doesn't happen! The last evening this happened was last year, and in the end everything turned out fine. BUT! That was only because people brought along something to show the group. So, and I say it every month, please do bring something along, whether you are a seasoned presenter or a nervous first timer (have a drink first). Last month was a great success, close to seventy attendees squeezed in to watch the Vyonyx presentation, standing room only! I look forward to seeing you again on Wednesday. This will be the new page to find out what's happening every month. It should be much easier to keep up to date now! The old address should redirect here. If you have any suggestions for this page let me know.